El Mundo (English: The World), formally El Mundo del Siglo Veintiuno (English: The World of the Twenty-First Century) is the second largest printed daily newspaper in Spain. 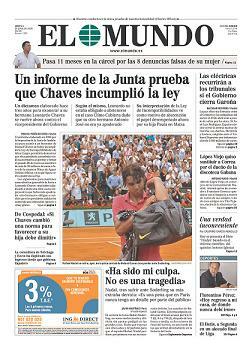 The paper is considered one of the country's newspapers of record along with El País and ABC. El Mundo was first published on 23 October 1989. Perhaps the best known of its founders was Pedro J. Ramírez, who served as editor until 2014. Ramirez had risen to prominence as a journalist during the Spanish transition to democracy. The other founders, Alfonso de Salas, Balbino Fraga and Juan González, shared with Ramírez a background in Grupo 16, the publishers of the newspaper Diario 16. Alfonso de Salas, Juan Gonzales and Gregorio Pena also launched El Economista in 2006. El Mundo, along with Marca and Expansión, is controlled by the Italian publishing company RCS MediaGroup through its Spanish subsidiary company Unidad Editorial S.L. Its former owner was Unedisa which merged with Grupo Recoletos in 2007 to form Unidad Editorial, current owner of the paper. The paper has its headquarters in Madrid, but maintains several news bureaus in other cities. The daily has a national edition and ten different regional editions, including those for Andalusia, Valencia, Castile and León, the Balearic Islands and Bilbao. It is published in tabloid format. In 2005 El Mundo started a supplement for women, Yo Donna, which was modelled on IO Donna, a supplement of the Italian daily Corriere della Sera. In January 2014 Pedro J. Ramírez, editor of the paper, was fired from his post. He argued that reporting on corruption scandals involving Spanish Prime Minister Mariano Rajoy led to his sacking. Casimiro García-Abadillo served as editor until April 2015, when he was replaced in turn by David Jiménez. Editorially, El Mundo often expresses the mainstream views of the centre-right with independent and liberal overtones. El Mundo has played a key role in uncovering a number of scandals, among them embezzlement by the commander of the Guardia Civil, accusations of insider trading and tax fraud by the governor of the Central Bank of Spain and aspects of the Bárcenas affair. Investigative reporting by the staff of El Mundo also revealed connections between the terrorist Grupos Antiterroristas de Liberación (GAL) and the Socialist administration of Felipe González, revelations that contributed to his defeat in the 1996 elections. In October 2005, El Mundo revealed that Nazi Aribert Heim (aka "Doctor Death") had been living in Spain for 20 years, probably with help from the ODESSA network, in collaboration with Otto Skorzeny, who had helped set up one of the most important ODESSA bases of operation in Spain, during the rule of Francisco Franco. After the 11 March 2004 Madrid train bombings, the newspapers El Mundo and La Razón, the regional television channel Telemadrid and the COPE radio network alleged that there had been inconsistencies in the explanations given by the Spanish judiciary about the bombings. Other Spanish media, such as El País, ABC and the Cadena SER radio network, accused El Mundo and the other media of manipulation over this issue. The bombings and the results of the subsequent judicial inquiry are still debated in Spain today. In 2001 El Mundo had a circulation of 291,000 copies and it was 312,366 copies next year. The paper had a circulation of 300,000 copies in 2003, making it the third best selling newspaper in the country. Based on the findings of the European Business Readership Survey El Mundo had 11,591 readers per issue in 2006. Its circulation between June 2006 and July 2007 was 337,172 copies. The 2007 circulation of the paper was 337,000 copies. It was 338,286 copies in 2008 and had 200,000 readers for the printed edition in 2009. The circulation of the paper was 266,294 copies in 2011. El Mundo (elmundo.es) is currently the second digital newspaper in Spanish. It was previously in the lead after El País introduced a payment system for access to the contents of its electronic version. It had 24 million unique web visitors per month in 2009. Many online readers are in Latin America, and the website has an edition for the Americas. However, digital expansion has done little to offset the decline in revenues from Spanish advertisers since 2008. The newspaper aims to increase digital profits via a subscription model. It launched a current affairs outlet only accessible to subscription customers, named ORBYT. ^ a b c José A. García Avilés; Klaus Meier; Andy Kaltenbrunner; Miguel Carvajal; Daniela Kraus (2009). "Newsroom integration in Austria, Spain and Germany". Journalism Practice. 3 (3): 285–303. doi:10.1080/17512780902798638. ^ Anna Galluzzi (20 September 2014). Libraries and Public Perception: A Comparative Analysis of the European Press. Elsevier Science. p. 28. ISBN 978-1-78063-425-8. Retrieved 24 November 2014. ^ a b c Raphael Minder (3 February 2014). "Founding Editor is Dismissed as Head of El Mundo". The New York Times. Retrieved 7 April 2014. ^ a b Ramirez (2014). "Fired for speaking out". New York Times. Retrieved 26 December 2014. ^ "El Economista". Presseurope. Retrieved 6 October 2013. ^ "Daily Press" (PDF). Unidad Editorial. December 2013. Retrieved 31 January 2015. ^ Laura Chaqués Bonafont; Frank R. Baumgartner (April 2013). "Newspaper attention and policy activities in Spain". Journal of Public Policy. 33 (1): 65–88. doi:10.1017/S0143814X12000219. hdl:2445/49364. Retrieved 24 April 2015. ^ a b Andrea Czepek; Melanie Hellwig; Eva Nowak (2009). Press Freedom and Pluralism in Europe: Concepts and Conditions. Intellect Books. p. 280. ISBN 978-1-84150-243-4. Retrieved 12 December 2014. ^ Donn James Tilson; Pilar Saura Pérez (2003). "Public relations and the new golden age of Spain: a confluence of democracy, economic development and the media" (PDF). Public Relations Review. 29. Retrieved 24 April 2015. ^ Jesús del-Olmo-Barbero; Sonia Parratt-Fernández (2011). "Typography and colour: A comparative analysis of the free and paid-for newspapers in Spain". Revista Latina de Comunicacion Social (66). Retrieved 23 February 2015. ^ "El Mundo - new readership record". OSP. 25 April 2005. Archived from the original on 6 January 2016. Retrieved 24 April 2015. ^ a b c "Spain's press freedom under fire in US media". The Local. 3 February 2014. Retrieved 1 January 2015. ^ a b Ashifa Kassam (25 March 2014). "Media revolution in Spain as readers search for new voices". The Guardian. Madrid. Retrieved 1 January 2015. ^ "El Consejo de Administración..." 30 April 2015. Retrieved 1 May 2015. ^ Lisa Abend (17 October 2008). "At Last, Spain Faces Up to Franco's Guilt". Time. Retrieved 22 October 2008. ^ Preston, Peter (2014). "All hail Pedro J Ramírez, Spain's crown prince of muckraking". The Observer. Retrieved 4 May 2014. ^ "Report: Nazi 'Doctor Death' Has Been Hiding in Spain Since 1985". Haaretz. 30 October 2005. ^ David Ward (2004). "A Mapping Study of Media Concentration and Ownership in Ten European Countries" (PDF). Dutch Media Authority. Retrieved 12 December 2014. ^ a b "elmundo.es launches Americas edition". Editors Weblog. 27 October 2009. Retrieved 6 September 2013. ^ Figures covering July 2010 to June 2011 from Spain's Archived 29 April 2011 at the Wayback Machine, Oficina de Justificación de la Difusión. Retrieved 28 January 2012. ^ "El País el periódico digital en español más leído del mundo". El Pais (in Spanish). 2016. ^ a b "'El Mundo' establece un modelo de pago en su web similar al del 'New York Times'" (in Spanish). Heraldo de Aragón. Europa Press. 4 November 2013.